Aglio e Olio if literally translated would be 'garlic and olive oil' so we know that the two main ingredients involved in this dish are garlic and olive oil. It is a simple dish but personally, I think the best partner for garlic is something hot like peppers or chilies. With a little Asian twist on this dish, we have ourselves an Asian style spaghetti aglio e olio. Heat the oven at 180 degrees celcius and roast the chili, skin side up for 15 to 20 minutes, just until lightly charred. Boil the spaghetti with a tablespoon of salt until al dente. Toss then set aside. In the meantime, heat the olive oil in a skillet or frying pan then add in all the curry leaves. Beware because if the leaves are wet, they might splutter so step back after adding in the curry leaves. Fry them for about 2 to 3 minutes and then take the leaves out and drain off excess oil from the leaves on a paper towel. You will now have a curry leave infused oil and bright green crystal-like curry leaves! Add the minced garlic into the oil and fry until fragrant. Once the chili is done, take it out of the oven and dice. Add this diced roasted chili into the pan. Fry for 2 to 3 minutes then add the ground dried shrimps and cherry tomatoes. Once the cherry tomatoes are soft, add some of the curry leaves (leave a few to sprinkle at the end) and the cooked spaghetti. 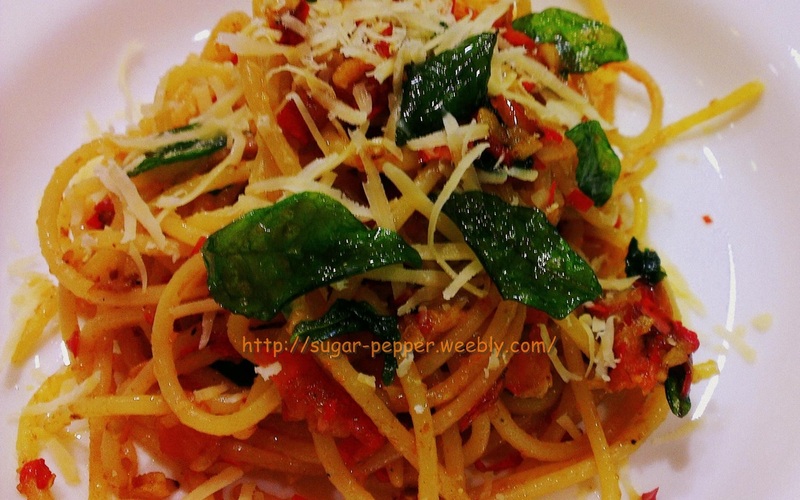 Toss the spaghetti in the pan and season with salt and sugar according to your preference. Transfer the cooked spaghetti on to a plate then serve with grated Parmesan and the remaining curry leave crystals.